MYRTLE BEACH, SC – If the opportunity to play the Pinehills course has not presented itself , you’re missing a real treat. Although not particularly long at 6640 yards from the Blue tees (72.2/132), 6112 yards from the White tees (69.8/125), 5692 yards from the Gold tees (67.8/119) and 4906 from the Red tees (67.4/113), the course demands accuracy. Wayward tee shots might take advantage of wide fairways, but will certainly add length and strokes. I had the opportunity to play Pinehills on a particularly hot summer afternoon as a single. There were few golfers on the course and I was able to enjoy a leisurely pace. I played from three different tee boxes, six holes each. It was a great opportunity to take in the character of the course. Virtually every Par 4 and Par 5 has interesting doglegs that require you to work your tee shot. On the front 9 only one Par 4 exceeds 400 yards from the blue tees. The back 9 is a slightly different story with four Par 4s playing at 400+ yards. From the White tees not a single Par 4 exceeds 400 yards in length. Only the strongest players can afford to leave themselves on the wide side of the dogleg and expect to have a good approach shot. As I’ve pointed out before, I am certainly distance challenged. However, today I was accurate with my tee shots and able to hit the majority of my target lines. Even from the Blue tees I was able to be competitive with the help of some nice up and downs. Even with the slightest error off the tee box, I would never have been in a position to get up and down. Bogey would have been my best opportunity. Each of the Par 5s at Pinehills is playable. No forced carries. No extremely penal traps, or hazards. For the average golfer they’re each 3 shot holes with an opportunity to get close and make a putt. Keep it in the fairways and think 2-putt Pars. No. 3 is a prime example of the need for fairway play. It’s a great golf hole with water on the right paralleling the fairway. Your second shot needs to be right center, but on the fairway. Going left is in jail with large trees preventing you from hitting into the green with your third shot. Although the Par 4s do have some length, it’s well placed tee shots that lead to good scores. Two of my favorites are back to back. No. 7 is a severe dogleg right over traps with water waiting those who run through the fairway. Take as much of the traps that you dare. An approach shot over water to the green makes Par a good score here. No.8 is a fabulous hole. This dogleg right tempts you to want to cut off too much of the turn. Play it safe and go left center on this fairway. It’s a long approach shot, but the smart play. The Par 3s are exactly - what you see is what you get. One caution is in order. Pay close attention to your club selection. This Arthur Hills designed golf course is at sea level. Y ou may want to think about clubbing up. Do not go up a club though and try to guide your shot. Take a full swing. Nos. 11 and 17 are the two shortest holes on Pinehills. I’m embarrassed to tell you how many times over the years I went into the front traps before I got it through my head that I needed more club. Unless you’re a sandie machine, club-up! The course was in great condition even though we are begging for rain along the coast. The rough is thick and reminds you to stay on the fairways. The Bermuda greens putted extremely well. The size of the greens is moderate, but their undulation can be challenging with tough pin positions. 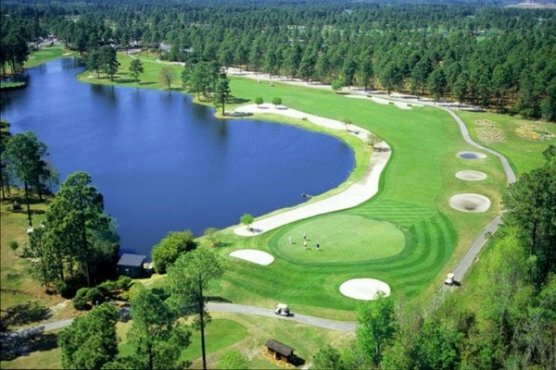 The Myrtlewood Golf Club Pinehills course is a classic course you’ll thoroughly enjoy. It’s centrally located making it accessible to virtually everywhere on the Grand Strand. Enjoy this one. I always do.